Outside the youthful eatery, the neighborhood, which is a National Historic Landmark district, is rife with monuments, along with the elegant Victorian row houses that once accommodated the city’s elite. Today, the area is at the forefront of a broader revival in the city—indeed, as if signaling this fact, this spring saw the opening of the Hotel Revival, a colorful boutique property in the heart of the neighborhood. Steeped in history as it is, the Mount Vernon of today seems very much focused on what lies ahead. You’ll see this impulse in places like the hip Mount Vernon Marketplace food court, which opened in 2015 in a former warehouse, and whose menu ranges from Chesapeake oysters to gourmet Mexican and Greek. Next door is Ceremony Coffee Roasters, whose bright interior calls to mind an Apple store—albeit one that sells avocado toast and nitro cold brew. This is not to suggest that the turnaround has happened overnight. For decades, Mount Vernon has been home to a thriving LGBT community, and has long boasted some of the best gay bars in town—along with a starring role in the annual Baltimore Pride celebrations. Then there are places like The Helmand, a quarter-century-old restaurant owned by the brother of a former Afghan president, which still ranks as one of Zagat’s top 10 Baltimore restaurants. Esquire declared the nearby Brewer’s Art the best bar in the country a decade ago. And the neighborhood’s longstanding ethnic diversity has spawned cuisines that span Afghani, Spanish, Indian and Nepali. The architecture, too, is remarkably diverse. Flanking Mount Vernon’s tranquil park squares are stately row houses built in a variety of styles: Second Empire, Italianate, Greek Revival. Next to Dooby’s is a tree-draped brownstone—the kind you might find in New York or Boston—that houses basement cocktail bar Sugarvale. Nearby, the beaux arts Belvedere Hotel, which hosted royalty and presidents in the early 1900s, now contains condos. The old Stafford Hotel—now an unusually elegant block for student housing—once hosted F. Scott Fitzgerald, who reputedly racked up a hefty bar tab. And while many of the area’s more prosperous residents fled for leafier neighborhoods in the early 20th century, their arts patronage left behind some of the city’s best cultural institutions. Among these is the Baltimore Symphony Orchestra, founded in 1916, and the imposing Enoch Pratt Free Library, which dates back to 1886. Mount Vernon is also home to Maryland’s largest professional theater, Baltimore Center Stage, whose past performers have included the likes of Anna Deavere Smith and Charles S. Dutton. Then, there’s the Walters Art Museum, which, on the day I visit, is showing an exhibition that provides an edgy take on Fabergé: digital prints superimposing images from modern life—such as a Starbucks storefront—on the famous eggs. Just down Charles Street from here is the 41-year-old C. Grimaldis Gallery, touted as the city’s oldest contemporary art space. In July, meanwhile, the neighborhood will host the three-day Artscape festival, billed as the nation’s largest free arts festival. 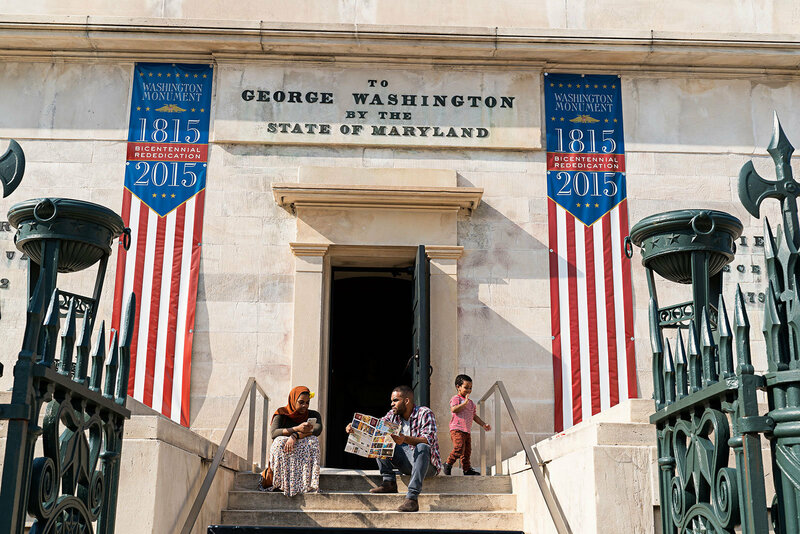 As Mount Vernon continues to draw younger, livelier crowds, cultural institutions are looking for ways to keep up. Baltimore Concert Opera, which was formed nine years ago after the city’s classical opera house dissolved, regularly holds what it calls “Thirsty Thursdays” events, which pair cocktail, beer and wine tastings with live opera in one of Mount Vernon’s most spectacular historic homes, the 19th-century Gilded Age Garrett- Jacobs Mansion. Nearby, on Charles Street, the neighborhood’s central artery, you’ll find The Elephant, a storied and gloriously ornate restaurant that reopened two years ago in a 19th-century mansion following extensive renovations. While Charles Street is booming, the subsequent hike in rents has led more and more local entrepreneurs to take to the side streets when looking for spaces. Down narrow Morton Street, a rainbow flag flies outside the café-record shop Baby’s on Fire. On the wall is a “staff picks” list, which includes The Mighty Lemon Drops and Fugazi, and a black-and-white poster advertising a 1976 Amsterdam gig by Patti Smith. I rummage for a bit, then take a short walk west to the equally funky Bun Shop bakery, whose interior resembles an artist’s loft—both in terms of the décor and the scruffy-chic kids munching the shop’s famous sweet and savory buns. A few doors down, you’ll find soy candles and vintage clothes at the two-year-old Knits, Soy & Metal and Keepers Vintage. There’s more vintage gear for sale across the street at Bottle of Bread. As the sun goes down, I head for a much-needed drink at Wet City brewing, a fashionable bar that opened a couple of years ago in a space once occupied by an Irish pub. Struggling to be heard over the booming sounds of Kendrick Lamar and Rick Ross, I ask the bartender if they have any fruity beers, and he pours me a Fruit Cup, brewed by the bar in collaboration with a D.C. brewery. The peach, pineapple and pear-flavored drink comes topped with a layer of slush—a boozier version of the convenience store refresher. So does commerce. In recent years, investors have pumped countless millions into lavish apartments, restaurants and hotels in the area. Four blocks north of Center Stage, a Relais & Châteaux property, The Ivy, opened three years ago in a 19th-century mansion, offering 400-thread-count linen sheets and private car service for guests. The hotel is located on a residential street, around the corner from the fine-dining institution The Prime Rib and a few blocks from a firehouse that was converted into Brew House No. 16. Across the street from City Cafe, a developer plans to demolish several historic buildings and build a modern 10-story apartment and retail complex. The newest of the lot (pictured above) opened in May, with 107 rooms in a 1929 deco-infused building replete with karaoke spaces and a rooftop restaurant with lovely views. The 3-year-old Ivy Hotel occupies a former Gilded Age mansion and features 19th- and 20th-century art, fine dining at Magdalena and an ivy-walled courtyard. The 162-room hotel opened three years ago in a 1907 building and features a cozy lobby with a fireplace, library and drinks from Poets Modern Cocktail & Eats. This gastropub features an oak bar, stained-glass panels and stag heads. Food and interior design evoke a Spanish taverna at this popular spot. The steak house is modeled after a classic 1940s supper club. Adaptive reuse is a fun element of Mount Vernon’s revival. Take, for instance, Brew House No. 16: Situated in a century-old firehouse, the 3-year-old brewery-restaurant has preserved the fire-engine red doors and industrial finishes. Another epic renovation took place at The Elephant, a storied Baltimore restaurant set in a 19th-century mansion. New owners revived it two years ago, preserving its Tiffany stained-glass dome, carved teak wood from India and Waterford crystal chandeliers. Down the street, Spirits of Mt. Vernon sells wine and beer from a mid-19th-century building. The restoration, which included installing a replica of the original tin ceiling and updating the aging structure, was featured on HGTV.